California is a clean vehicles leader—but more can be done, especially with freight. In 2002, California became the nation’s first state to introduce global warming pollution standards for cars and trucks. Washington and Oregon followed California's lead in 2005 and 2006, respectively. These standards followed decades of transportation leadership in California, and paved the way for 2012’s nationwide fuel economy and pollution standards. Because of this, new vehicles in California will by 2025 have about half the global warming emissions and nearly twice the fuel efficiency of 2010 vehicles. Considering Californians drive some 320 billion miles every year, these standards help ensure significantly less pollution, fewer global warming emissions, and fuel savings at the pump—and they're already working. California’s Zero Emission Vehicle (ZEV) program requires plug-in electric and fuel cell vehicles—which are cleaner than conventional vehicles—to account for about 8 percent of California’s new vehicle sales by 2025. Related policies include publicly-funded charging and hydrogen fueling stations; building codes that encourage electric vehicle (EV) charging; EVs in public fleets; and favorable electricity rates for home charging systems. By encouraging EV ownership, California is creating jobs, reducing pollution, and saving consumers money at the pump—all while reducing U.S. oil use. Replacing oil with cleaner fuels can help reduce global warming emissions—but it depends on how the fuels are made and what they’re made from. 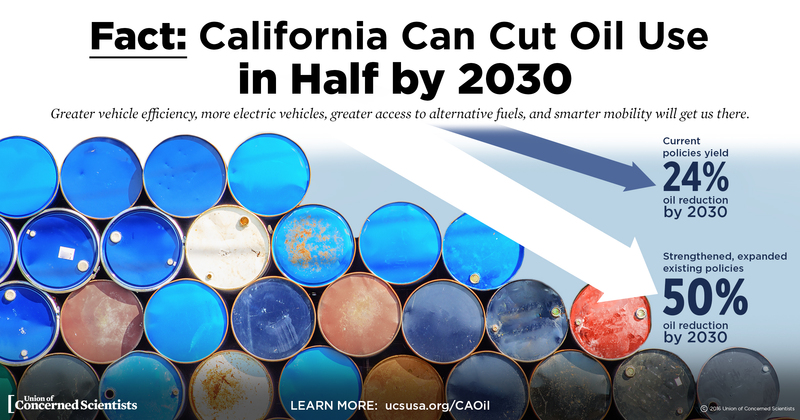 Adopted in 2009, California’s Low Carbon Fuel Standard (LCFS) incentivizes cleaner fuels by requiring a ten percent reduction in global warming pollution from California's fuel supply in 2020. Consequently, the policy encourages the use of better biofuels, biogas, and electricity, while disincentivizing dirtier sources, such as tar sands. The LCFS is based on full lifecycle carbon emissions, which adds up heat-trapping pollution from each stage of a fuel’s production and use. California’s approach is a model for clean fuel policies in other states, including Oregon and Washington, and is closely related to the Federal Renewable Fuels Standard. With about 40 percent of the nation’s containerized imports arriving through Californian ports, the freight sector is one of California’s top polluters, and a major contributor to climate change. California has led the nation in efforts to protect public health from diesel emissions, but the most impacted communities near ports, rail yards, and freeways still suffer from elevated risks. Fortunately, a cleaner, more efficient freight system is possible with technologies available today—but it requires the same forward-thinking that made California a leader on car and truck fuel efficiency, EVs, and cleaner fuels. Linda's research shows that idling for longer than 10 seconds wastes more fuel than stopping and starting your car. View the graphic or read the analysis.